Floriferous, compact variety with deep blue flower heads July to September. 45-50cm. high, for sun and free drainage. 1 litre pot. Beautiful new cultivar with bi-colour flowers, pure white with a striking blue base. July to September. 60cm. high. Nodding, Snowdrop-like, waxy yellow bells held on airy 30cm. stems all summer. For well drained soil and sun. A good clump-former with rose-pink umbels hanging gracefully from 40cm. flower heads. Summer flowering, for sun and good drainage. 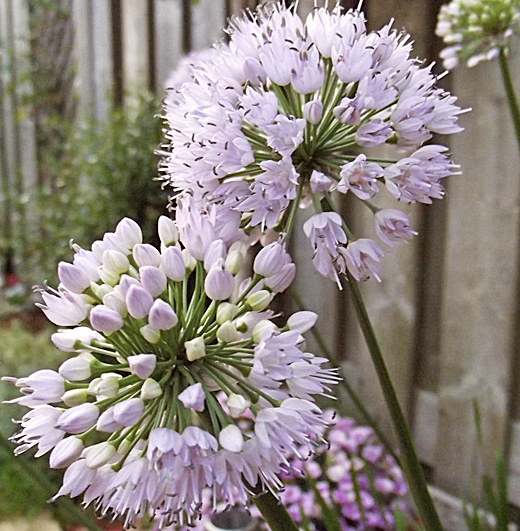 One of the best ornamental Alliums (2018 Plant of the Year- Perennial Plant Association). Compact clump former with numerous heads of soft purple flowers, June until August. Loved by bees, 45cm. high, for sun , ordinary soils. 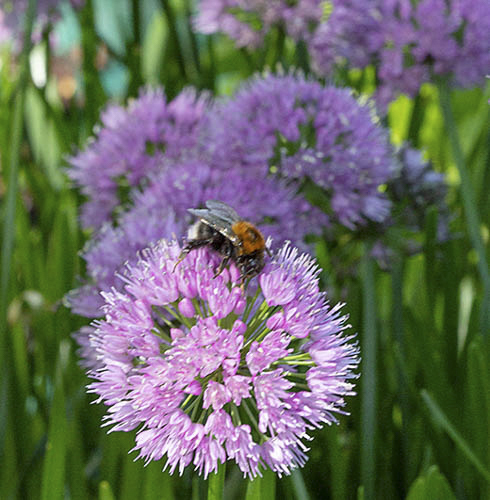 Lovely compact clump former, producing masses of lavender-pink spherical flower heads, June to August. Loved by bees and butterflies. 30cm. high, easy in ordinary soils in sun or part shade. 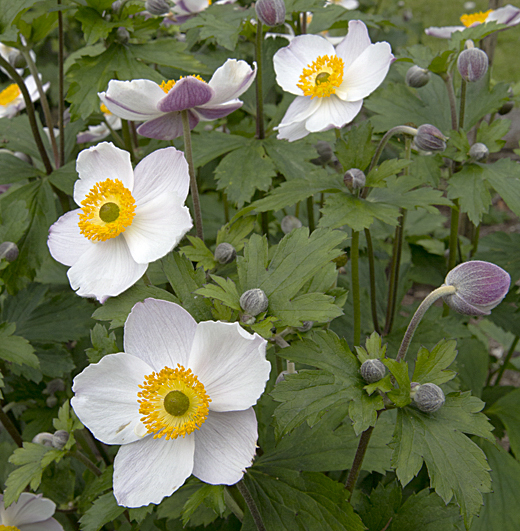 During the past 12 years or so, since Anemone 'Wild Swan' appeared to be so promising, we have been developing variations and we now include more of the series. 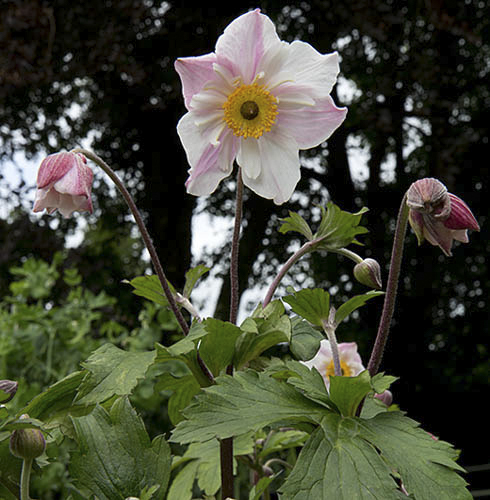 These have more Anemone x hybrida in their breeding, but have retained the clump forming and early flowering, as well as the attractive colour bands on the flower reverse. (EM) A further addition to our 'Swan' series with semi-double white flowers held on dark maroon-pink stems, with striking dark pink reverse to the petals. 45cm. high for rich soil in sun or part shade. 1 litre pot. (EM) The first flowers to appear are single, followed by the typical large semi-double white, blue-backed flowers, from the end of June until October. Compact, nice vigorous upright habit to 50cm. high. Sun or part shade, fertile soil. 1 litre pot. (EM) Another new cultivar in the 'Swan' series with a mass of white, blue-backed flowers from June until the autumn. 50cm. high. Easy in any fertile soil, sun or part shade. Good clump former, fertile soil in sun or part shade. 1 litre pot.